Today we’re detouring from our normally scheduled technical programming to explore some larger thoughts and action items to use in work and life. 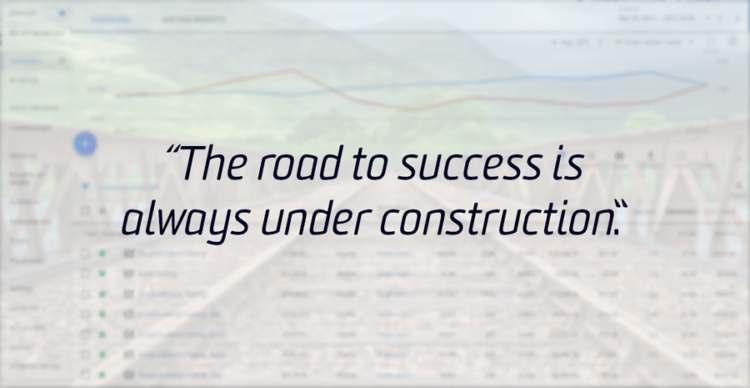 Lily Tomlin once said, “The road to success is always under construction.” At least, I think she once said that. These days, you blindly trust the internet to assign the right quote to the right person. But, I digress. We are works in progress, constantly evolving and changing as we grow older and wiser. The same can be said of AdWords … I mean Google Ads. Remember that perfection is not guaranteed on the first try. We can make preparations, make assumptions, plan everything down to the second, and then follow the road to either success or failure. 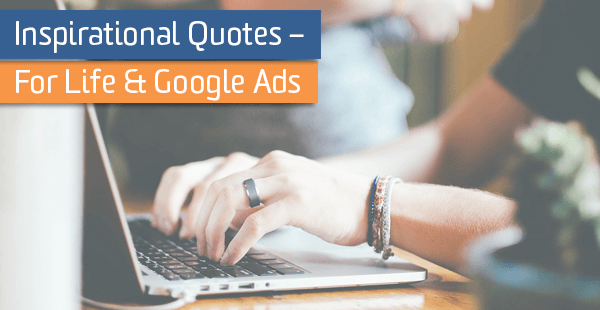 I’ve run many Google Ads campaigns. Some of them have been extremely successful, while others have been works in progress. It is our job to learn how to improve and make a next-step plan of action. And most of the time, the “failures” turn out to be pearls of wisdom that enable you to perform even better in the future. Going into campaign or account planning of any kind, remember to take a step back and know that each launch, each platform you test, each audience you target – they all get you to a further point in the road. Your job is to build the road that eventually leads to the golden ticket of performance. You may take a detour here or there, but you will learn what works, what doesn’t work, and how to improve. It’s true. Being a great listener is a valuable trait. I remind myself to always be invested in other people’s perspectives, feelings, and what they’re going through in life. You can see a change in your entire life by caring about those around you – and showing it. Tune into the needs, likes, and dislikes of those around you. Who is this person? What do they need? How can I help them? These are some of the same questions you can ask when trying to target your audience. 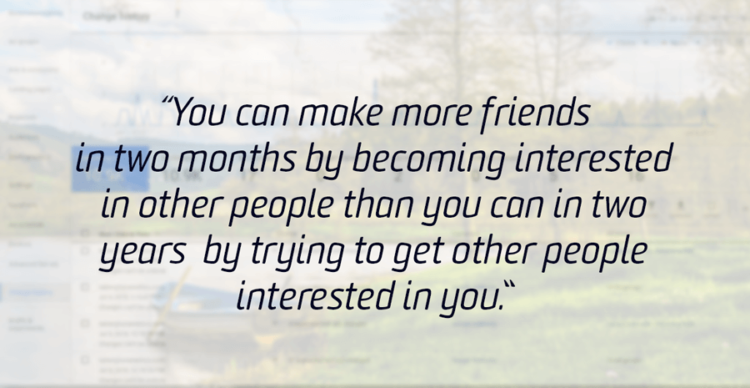 Learn what makes them interested. Is it a better price, great customer service, exciting promotions? I recently conducted extensive research about a vertical that I would never, ever have learned about if it wasn’t a client. I learned about their users. I became interested in the applications of the product. And man, did we see great click-through rates from our campaign because of the extra interest that was taken in the research phase. I would argue that life is a combination of both. I strive to “find myself.” To understand what is going on right now. I also strive to create – to create a better version of myself to present to the world and those closest to me. But what if we didn’t create something new? What if we were tied to finding what is already there without making it better? I would say that we would grow stagnant. The same can be said of our work. The digital marketers around me are creative. They see what is there and want to change it, make it better, try something new. Create. Think about your campaigns from a new perspective. Flip them on their heads. What if you tried this a different way? What if you tested a new strategy on a new platform? What if you questioned the value of each step in your conversion funnel? What if you spoke to users in a different tone; serious, funny, down-to-earth? 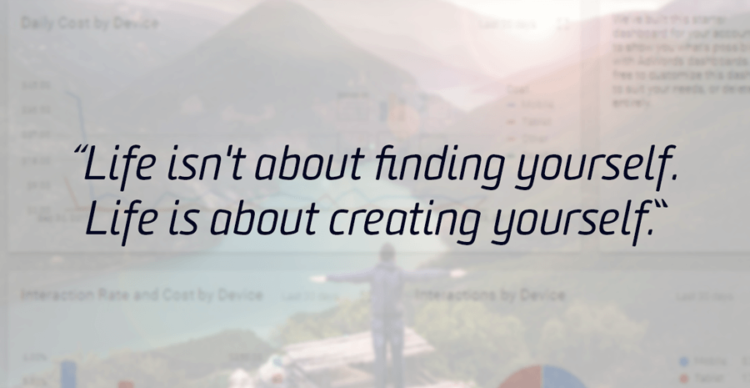 How can you create something different and new? I pondered this one for a while and came to the realization that I wholeheartedly agree. And, should try to implement in my life. Preparation is key to success. With a “dull ax,” the work will take you 2x, 5x, 10x as long and the result may be worse. A “sharpened ax,” which was delicately handled and made just right for the job, will make for a simpler, easier, possibly faster task. 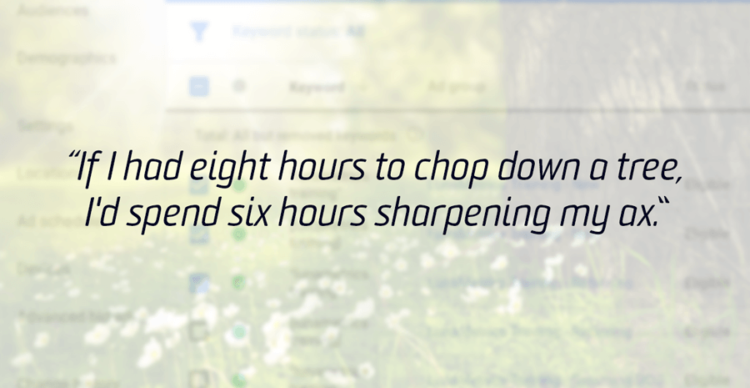 Prepare and prepare and prepare more – and your work becomes easier. When my colleagues write blogs, they all usually follow the same format. Write an outline, put notes or bullets and fill in the rest. Me? Not so much. I painstakingly try to write every *perfect* word down (which I do NOT succeed at) only to follow that process with several re-writes. Eventually, I strip the whole thing down and start again. This is not the most effective way of producing a product. This piece of inspiration is something that I use to better myself. Prepare. Prepare. Prepare. Once you have your plan all laid out, implementation is simple. Do the necessary research, lay out your project plan, including how you will measure success or progress. Your life and work will benefit. Your clients will appreciate your organization, attention to detail, and preparation. Once I perfect the art of preparation, I can toss my full stack of belated birthday cards. “For most of life, nothing wonderful happens. 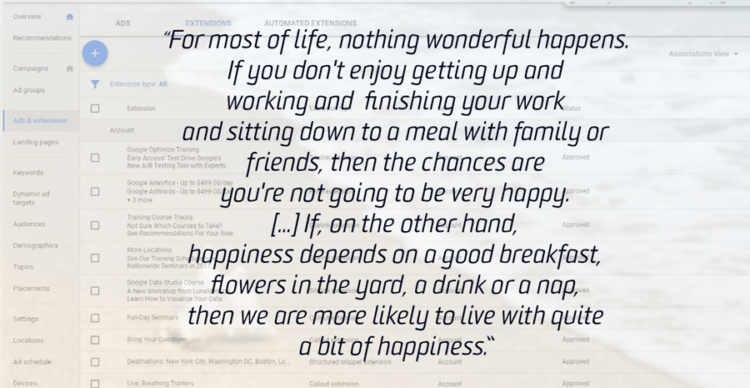 If you don’t enjoy getting up and working and finishing your work and sitting down to a meal with family or friends, then the chances are you’re not going to be very happy. If someone bases his/her happiness on major events like a great job, huge amounts of money, a flawlessly happy marriage or a trip to Paris, that person isn’t going to be happy much of the time. Extract happiness from your everyday routines. Remember that you are privileged to get up healthy every day, do something productive at work, be a great listener to those around you, keep trying to improve and create in your personal and work life. Remember this on every client call, every project plan, every daily optimization. When you are working hard. When you should be working harder. Remember that happiness is in the everyday and take joy in the fact that you can control whether you view today in a positive or negative light. Note: These quotes have been attributed to the best of my ability.